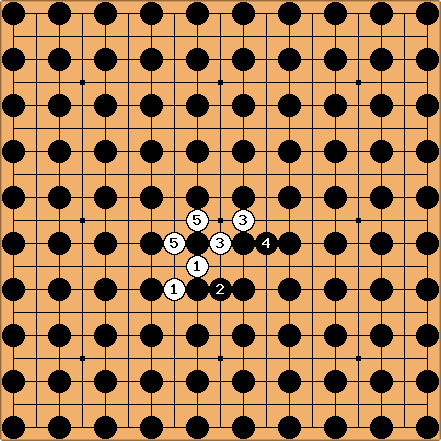 White is allowed to place two stones at each turn (one after the other). Who has the advantage: the hare or the tortoise? tderz: I'm just adding this link Snow White In The Dark Woods. To think about the winning chances has to come later. 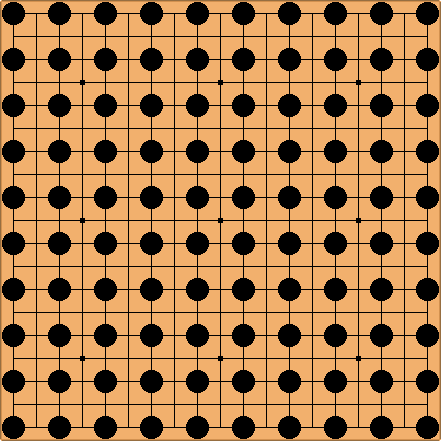 Whether linking to the edges in 10 moves and/or capturing something is enough, I have to ponder about. I edited some time ago an exercise like this as training for miai thinking. At a given time (no homepage yet) I will uplink it. unkx80: I think White will win. Mef: I agree, while I haven't seen this exact setup used, I've seen quite a few 2 to 1 move variant games and it is quite the advantage (namely because black will have extreme difficulty in capturing any stone white plays, and in trying to keep his own stones connected). unkx80: I don't have any definite proof. =) But some elaboration on my intuition on why White should win. ... and so on. I don't think Black can keep up with this pace. unkx80: And a question on rules. If a surrounded black group has two eyes, is it alive? Robert Pauli: Sure - "one after the other"